Sofie Muller participated at Coup de Ville 2013. This text was published in the catalogue. The oeuvre that Sofie Muller primarily develops with drawings and sculptures is often inspired by intense social or emotional experiences. With her intervention for the Coup de Ville exhibition, she is for the first time experimenting with the attraction and repulsion of magnets. 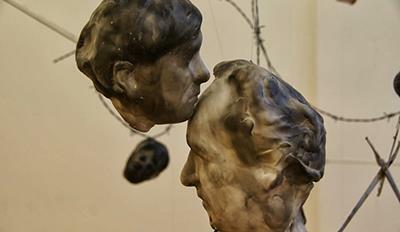 These lie hidden in sculpted heads that, attached to wires, offer resistance to the force of gravity. The reciprocal relationship is reinforced by means of a proliferation of barbed wire inside the room, thus creating a tightly knit network of forms. Although analogue and using tangible materials, this installation represents a paradigm of the present world that is characterised by its virtuality with unreachable connections beyond our grasp. Physically and geographically, we invariably still find ourselves within the boundaries of a country while, at the same time, we have ‘cast off’ the restraints of boundaries by means of the Internet. This virtual (wireless) topography creates the impression that gravitational pull no longer exists. In sculptural history, the weight of sculptures was severed by Alexander Calder by way of ‘mobiles’ held to the ceiling. 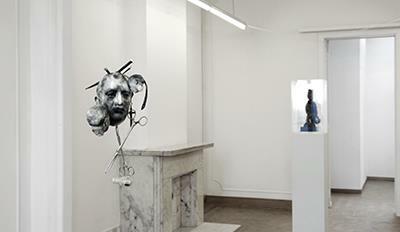 Beyond their apparent playfulness, these sculptures evoke questions about the gravitational point of mass and forms. This fits nicely into Sofie Muller’s interests: the discovery of a point of equilibrium in our existence. Thus, a reference that will serve as an orientation point to enable us to understand the world. In the artist’s view, a basic condition to gain insight is to be found in the unconditioned thought process. For that reason, she uses in the fashioning of the heads a surrealist fumage technique that, within her oeuvre, has acquired special significance. 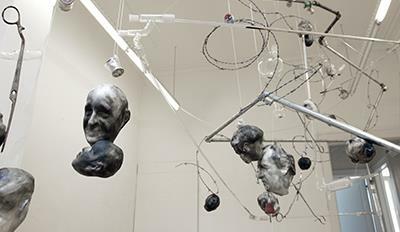 In earlier sculptures such as ‘Clarysse’, ‘Brandt’, ‘Oscar’ and ‘Jonas’, the artist uses to advantage this ‘smoky’ technique to create the phenomenon of the black out: an instance of memory loss or diminished awareness. The notion of using smoke has is borrowed from Ray Bradbury’s novel Fahrenheit 451, which tells of book burning by fire fighters (knowledge and freedom of thought). The erasure of ideas and censorship – the Internet’s pitfall – constitutes a threat to our society. One may interpret the combination of heads and magnetism as a plea for spirituality and the spiritual.